Because my mother had me at the same age I had my daughter, I find myself comparing the changes in many aspects of our personalities, outlooks, culture and relationships. In doing this assignment for Writing 101, I thought it would be interesting to take a look at the differences in being 15 through the ages. She chose to describe the years 1945 when her mother was fifteen and 1965 when her sister was that age and her own year as a fifteen-year-old girl in 1979, her daughter’s fifteenth year was 2013 called #being15 age of the Hashtag. We have “met” at our Word Press writing course 101. My mother was fifteen in 1938, I was fifteen in 1965, and my daughter was that age in the year 2000. Our lives are lived in Denmark and Carol is from the U.S.A.
My mother was 25 when she got my twin brother and me. I was 34 when I got my daughter, my third child, and my daughter was like my mother 25 years old when she got her first-born. 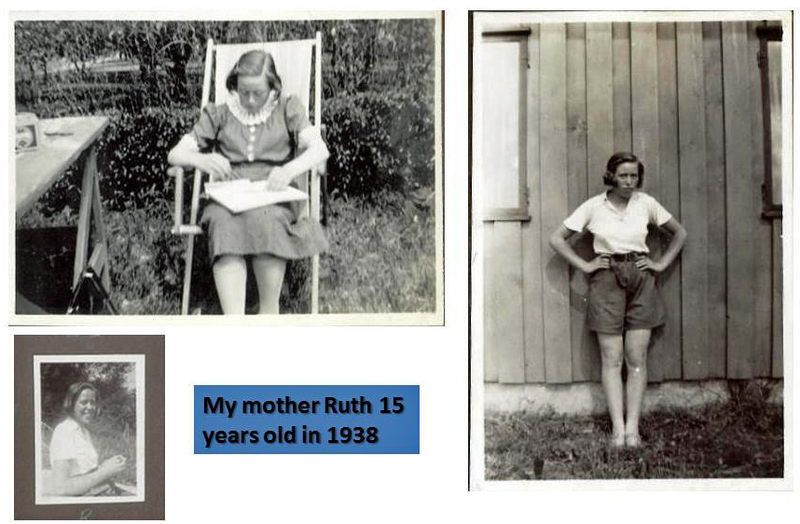 My mother Ruth’s fifteen’s year was in 1938 in Denmark. It was two years before we in Denmark were taken over by the German forces, but Hitler had already been in power in Germany for five years. My mother loved her family, had never been in rebellion to them or the school. She loved school and did very well. At that time and in my time (1962) as well the fifth grade in 1935 had a challenging exam that sifted the children in an academic or a practical direction. She passed and her school year in 1938 was the so-called I Real ( the eights’ year) were III Real ended with a final exam. She took that in 1940. Those who were going to university had to go to the so-called “Gymnasium”, and that was only for the very few and chosen. Mostly boys! She loved to dance and had been to dancing classes since her early youth. (The pictures are from the years before 1938.) Then she would collect her many friends and take long bicycle excursions. She even let her younger brother go with her and the girlfriends. Later during the war, the two siblings stayed together in a small flat in Copenhagen. Ruth was working at a pharmacy and in the evenings studying to be able to enter university after two years of intensive studies. Her brother was studying law. Due to exhaustion, she has to give up on these intense studies while working and later she took a financial education. I have a post called Bill & Ruth a very romantic story about her relation to a British soldier in 1945. Ruth loved to follow a very young long-distance swimmer called Jenny Kammersgaard. I wrote a post on her. My mother would have liked to study languages at the university, but at that time if any were going that far, it would be the son in the home. After school finished in 1940, she got an apprenticeship at the local pharmacy. The American movies were something the young people liked to see at that time. I think it was often movies with both singing and dancing. (Fred Astaire and Ginger Rogers). I also remember that she liked so much the little darling Shirley Temple. 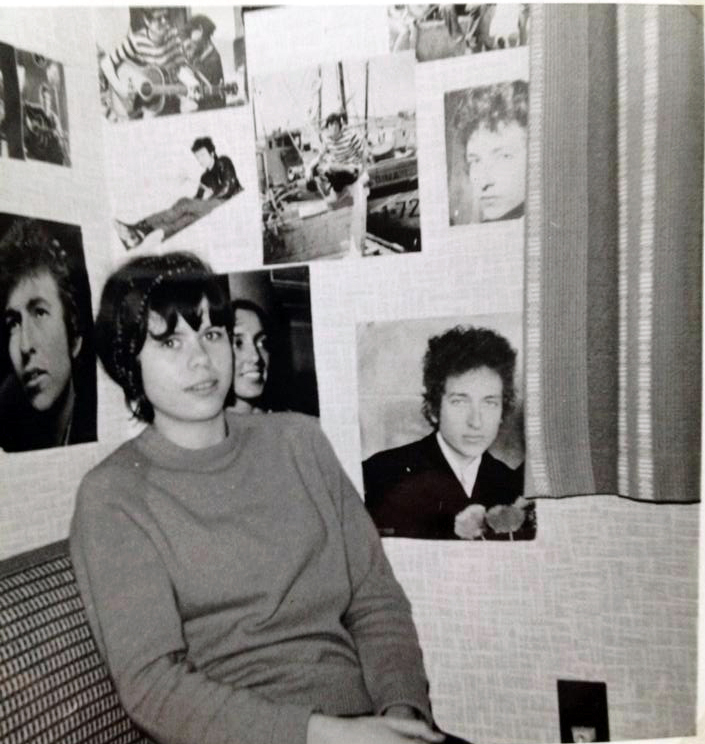 I was fifteen at the height of the Beatles fever in 1966. I loved them very much as well as many other beat groups from England and some from the States like the Beach Boys. The protest singers Bob Dylan and Simon & Garfunkel were also top-rated. That was before I came across the classical music as I wrote about lately. In the mid-sixties, I could see fashion clothes on pictures in magazines from London. Here in Denmark we still didn´t have smart fashion clothes for young people. I made a drawing of the clothing I wanted to get and got help from my neighbour to make it myself. I was very proud to wear something that couldn’t be found in a shop. I saved money by babysitting, and we had an office that administrated the places where we were going to babysit. Often I would walk or go home by bicycle in the middle of the night, long distances, because else my salary would go to taxi driving. Some lovely parents gave me extra money for a taxi though. My mother really had missed the kind of schooling that we could get in the sixties, so it is evident that my brother and I went further on to the “gymnasium” three-year schooling preparing for university. In that particular year 1966, I had a lot of Latin lessons, which were difficult, but I liked the pressure of having to learn the grammar. I went to England with my parents on my first holiday abroad. I had looked forward to this tour for a very long time as I loved the English language. I had saved money by working two or three weeks in a factory. It was very tough with long hours and minimal salary. I was utterly exhausted and knew that I would never be able to manage a job in a factory. In England, I realised that the earned money didn’t reach far and even there it was difficult to find smart clothing. The pictures in the fashion magazines were not taken in shops I found! I was also very disappointed as I travelled from Manchester to Liverpool to see the Cavern club and other places where The Beatles had started their career. All buildings were black and dirty from the coal used for power. But still, this journey was a real highlight of my teenage time. Mostly because we visited the friends of my mother who she had met just after the war and with whom she had faithfully kept a correspondence. My daughter was fifteen in the year 2000. I don’t remember the music that was popular then, but my daughter for sure liked those that were on top at the time. She was very good at figure skating, so we went together sometimes for contests. I remember the hunt for material and design for the dresses that should match the music and the theme of the performance and the skates were very heavy and expensive. The judges were very strict and indeed also the Polish trainers. But she learned a lot of discipline through this and never to give up or get angry over the results or envious of the other girls participating. After her fifteens’ year, she was allowed to an American High School in Iowa. The admittance was very strict because the firm that was in charge only wanted young people, who knew how to obey the rules. She changed family three times but finally found the family who would accept her and they are still in contact. One family just regretted, and the next “mother” got an alcohol problem during her time there and the last and right home she found herself at the High School. Back in Denmark my daughter wanted to earn money while she was at school so she worked a lot at Mac Donald’s, so much that her school performances could have been better. Like me, she was very occupied with fashion, not by sewing her self, but by arranging fashion shows more than once in her town at a very young age. The money was spent on clothes and on many travels abroad. Today she is doing very well a mother of two girls and working in a vast firm doing media tasks after having taken a Candidate in Media Science. What a good family post. All of you were motivated and artistic.